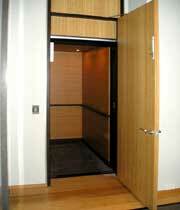 Summary: This home elevator has custom wenge and bamboo walls. 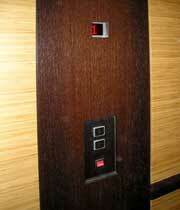 These were added on-site by the project finishing carpenter to match the exotic interior of the house. 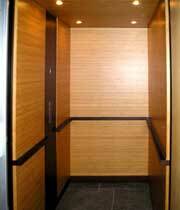 When the elevator was installed, it had unfinished mdf walls. A panel was also installed to block access to the space above the cab when the landing door is open. 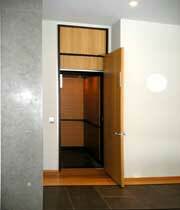 This is required by code when the cab is a standard seven-foot height, but the doors are taller.